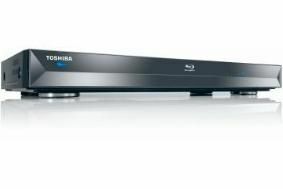 IFA NEWS: Toshiba's first Blu-ray player is coming! | What Hi-Fi? IFA NEWS: Toshiba's first Blu-ray player is coming! The BDX2000 will be in British shops in December, and will offer BD Live profile 2.0 support, 1080p upscaling, DivX/AVCHD playback and compatibility with the company's Regza-Link HDMI control system. In addition, the new player will have an SDHC-compatible SD Card Slot, from which it will be able to play audio and video. Along with the controls, it will be hidden behind a drop-down smoked/mirrored front panel. Ahead of the player, Toshiba will launch a notebook PC with Blu-ray drive, the Satellite P500. With an 18.4in screen, this will become Toshiba's Satellite flagship when it goes on sale late next month. The drive is a Blu-ray re-writer, and the computer also has Toshiba's Resolution+ upscaler, and an HDMI output complete with Regza-Link. Intel Core 2 Duo processors are used, and the computer supports up to 4GB of DDR memory and disk drives of up to 500GB. NVIDIA graphics chipsets are used, the display is one of Toshiba's TruBrite LCDs, and the speakers are from Harman/Kardon. Prices are yet to be announced for both products, but we have review samples ordered and on the way.